A few weeks ago I posted an article about Scottish artist Malky McCormick painting a large plaster Clydesdale horse which can be read here. This horse and a number of others were to be displayed in the town of Hamilton in South Lanarkshire. 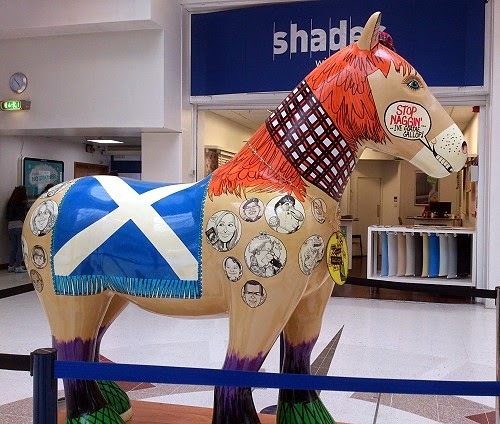 The horses are part of the Ready Steady Gallop event and are on display from 25th June until 6th September in Hamilton Town Centre in South Lanarkshire, although a few are located outwith the centre. I managed to photograph all but three of them and will get the remaining ones soon. The display has been organised by the Hamilton Business Improvement District to encourage visitors to the area and get some exercise at the same time! Local artists have painted the horses and the results are quite stunning. Below are a few of the horses on display. 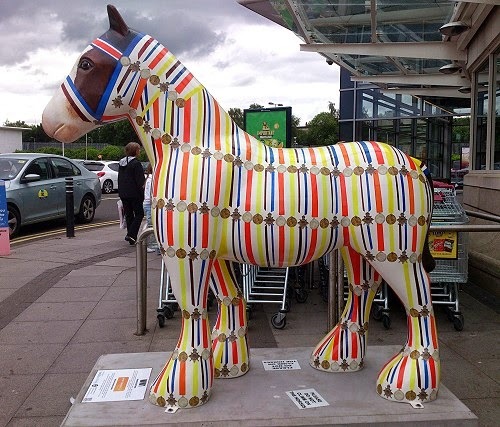 The First World War Horse is located outside Sainsbury's supermarket in Douglas Retail Park and is sponsored by the company. It is decorated with the British First World War Medal Trio including the Allied Victory Medal, the British War Medal and the 1914 Mons Star. 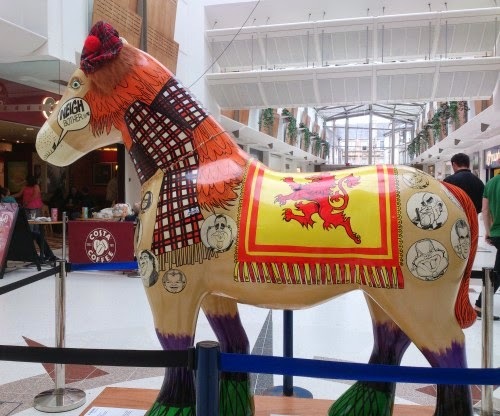 It was designed by Jayne Stokes in remembrance of the large number of Clydesdale horses conscripted for the war effort, many of whom suffered along with the brave men and women. 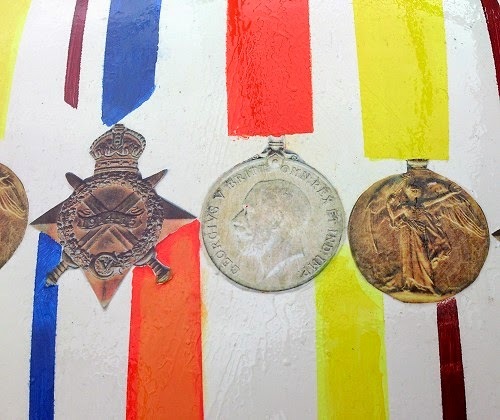 In the above photograph can be seen the First World War Medal Trio of the 1914 Mons Star, the British War Medal and the Allied Victory Medal. This bronze medal award was authorized by King George V in April 1917 for those who had served in France or Belgium between 5th August 1914 to midnight on 22nd November 1914 inclusive. The award was open to officers and men of the British and Indian Expeditionary Forces, doctors and nurses as well as Royal Navy, Royal Marines, Royal Navy Reserve and Royal Naval Volunteer Reserve who served ashore with the Royal Naval Division in France or Belgium. There were approximately 378,000 1914 Stars issued. Each of the allies issued their own bronze victory medal with a similar design, similar equivalent wording and identical ribbon. The British medal was designed by W. McMillan. The front depicts a winged classical figure representing victory. Malky was seen recently in Hamilton Regent Shopping Centre painting 'Regent'. 'Regent' has the Scottish flags painted on it with the Lion Rampant on one side and the saltire on the other. Well-known Scottish people are also painted on the horse. 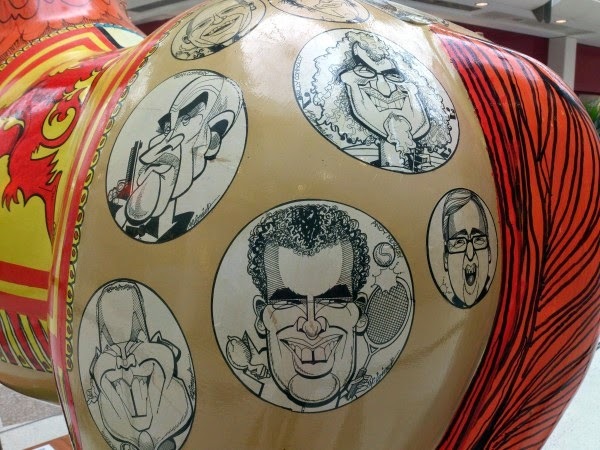 The Scottish personalities on the above photograph include Andy Murray, Billy Connolly, and Sean Connery. Above are just two of the horses. I will include some more on a later posting. Ready, Steady, Gallop - all information relating to the event including location map.